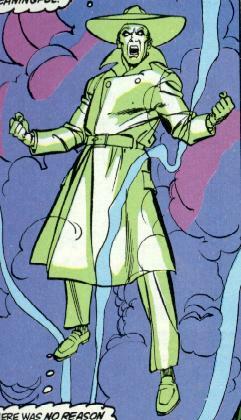 Powers/Abilities: The Witness is a paranormal who exists in a state similiar to that of a ghost. He cannot touch solid objects, and cannot be perceived by most humans. So far, only Randy O'Brien's Anti-Bodies, Spitfire's MAX armor, and those who wield the Star Brand have been able to see him. He was also able to possess the body of Randy O'Brien briefly, due to O'Brien's connection to his Anti-Bodies. The Witness is drawn to the awakening of new paranormals, and was similiarly drawn to the "Black Event" caused by Kenneth Connell. History: (DP7 Annual#1)- On July 22, 1986, Nelson Kohler was driving down a highway in Wisconsin when the phenomenon known as "The White Event" occured. Blinded by the flash, he drove off the road and crashed. Kohler was brought to a hospital, but he was diagnosed as being brain-dead, kept alive only by machines. His wife Maureen declared that, "Nelson used to joke that people were like personal computers. The body was the hardware. ...The mind, the spirit, the...intangibles that make a person what he is -- they were the software. When the hardware became broken, obsolete...the software had no place to run anymore... Doctor Morgan, my husband would not want to live like this. Let me have the necessary forms to have his life support machines...turned off. Let God decide if he should live...not some hardware." Kohler's life seemingly ended on the table -- but he immediately found himself conscious, and tried to communicate with his wife and daughter, only to find that he was intangible. Slowly Kohler came to realize he was like a ghost, completely immaterial. He departed the hospital to escape his family's grief, and automatically became garbed in clothes -- likely because of his own modesty. As Kohler pondered what to do, he found himself strangely drawn elsewhere, and followed the sensation. On July 25th, Kohler arrived at the Sunny View Nursing Home in Eau Claire, Wisconsin, where he witnessed the emergence of Lenore Fenzl's paranormal power to sap energy from others with the light produced by her body. Kohler then found himself drawn elsewhere. On August 2nd, he came to the home of Stephanie Harrington in Sheboygan, Wisconsin. He observed the emergence of Stephanie's ability to energize others when Stephanie caused her daughter Jilly to become extremely energetic. He was then drawn elsewhere. On August 31st, he came to Green Bay, Wisconsin, where he witnessed how young Dennis Cuzinski's body had come to secrete an acid-like substance. He was then drawn away again. On Septmeber 15th, he viewed the emergence of Charlotte Beck's ability to control the power of friction while she was in the midst of dancing at her college at Racine, Wisconsin. On September 20th, he was in Oshkosh, Wisconsin, where he watched with some horror as David Landers' body transformed, while muscles literally grew all over his body. On September 26th, he came to Milwaukee, Wisconsin, where Burger King manager Jeff Walters developed the power of superhuman speed. By now, Kohler wished only to end his existence, and hoped that he might find such a person somewhere in his travels. His next trip brought him to DePere, Wisconsin, where he saw how doctor Randy O'Brien could generate a dark "Anti-Body" duplicate of himself. Kohler wondered now if perhaps he was responsible for all the transformations he had seen, and decided to somehow return to his body. He entered his own grave, but found that he couldn't make himself die. "My consciousness refuses to shut down. My software refuses to be erased!" Overcome with despair, he suddenly felt a touch on his back, and found himself facing one of O'Brien's Anti-Bodies. The Anti-Body could not only touch Kohler, but see him as well. Unfortunately, it could not speak, and Kohler quickly became angry at it, and lashed out against it, trying to force it to kill him. In his anger, he feared he might have killed the Anti-Body himself. He went to check on O'Brien to see if the Anti-Body's "death" had harmed him, and found to his surprise that he could take over O'Brien's body. Joyously, he set out to relive his life, but was then confronted by the Anti-Body, which was dying without O'Brien's body to return to. Overcome with guilt, Kohler departed O'Brien's body, and let the Anti-Body return to its home. Kohler then set off into the sky, now content to no longer speculate on his existence. "If my fate is to never again be a participant in the world of the living -- so be it. I will content myself to be a mere witness." (The Pitt)- On December 22, 1987, Kohler felt a new sensation -- something twisted and dark. He journeyed to Pittsburgh, Pennsylvania, where he arrived just in time to witness Kenneth Connell's attempt to rid himself of the Star Brand by transferring it to a barbell. The resultant explosion destroyed Pittsburgh. Kohler saw Connell's body being swept away, but turned back to see the damage done to Pittsburgh. During his time surveying "the Pitt", he hallucinated, seeing the people slain blaming him for their fate, trying to slay him. After regaining his senses, Kohler encountered Jennifer Swenson, operating her MAX armor. To his surprise, she was able to perceive him, but he ducked away, not certain if she was real. Having witnessed all of this, Kohler determined that he would make his life meaningful -- by finding Kenneth Connell and killing him! (Star Brand#13 (fb) - BTS)- The Witness raised the spirit of Ken Connell's friend Myron Feldman (or possibly assumed his appearance) in order to torment Connell. Feldman promised to serve as Connell's conscience, to make sure he never screwed up again. 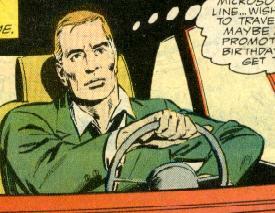 (Star Brand#15 - BTS)- After losing the Star Brand to the Starchild, Connell was driven off a cliff by Myron's spirit. (Star Brand#17)- Some time later, Kohler was drawn to Jacob Burnley, then-wielder of the Star Brand, who attempted to re-create Pittsburgh with the Star Brand's power. However, Kohler revealed to Burnley that this was impossible -- that all he had accomplished was to create a "memory" of Pittsburgh -- the city itself was lost. Comments: Created by Mark Gruenwald, Lee Weeks, and Tony DeZuniga.